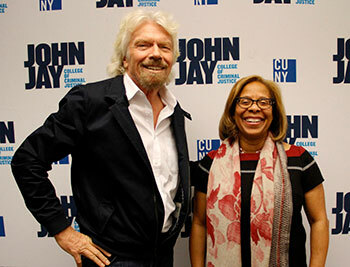 On October 17, Sir Richard Branson visited John Jay College to speak about the role of social good in business as part of a live national broadcast organized by the National Society of Leadership and Success (NSLS). As part of their goal to develop the leadership potential of students, NSLS, which has over 500 chapters on campuses nationwide, offers students the opportunity to hear from influential leaders from a variety of fields. In addition to Branson, NSLS has hosted talks with Trevor Noah, Anderson Cooper, Arianna Huffington, and many more. Because they are broadcast nationally as well as recorded for later viewing, each talk is accessible to students regardless of where they are based. At John Jay, the NSLS chapter is relatively new at only three years old, but the chapter’s future has been promising since its inception in 2015 when former student and Forensic Psychology major Angelica Puente-Soto approached Danielle Officer, Director of the Center for Student Involvement & Leadership, with the idea to start the chapter on campus. Once approved, the program quickly grew. “Our goal was to have 50 students, but in that first year, we had nearly 600. We ended up having induction in the school gymnasium, and the President of the Society attended,” said Officer. After that first massive success, the John Jay College chapter has grown and has continued to gain attention from NSLS executive leadership. 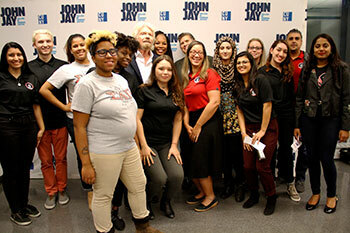 After hosting a regional leadership retreat hosted over the summer, John Jay was selected to host a speaker broadcast with Sir Richard Branson, which is an opportunity that is only extended to strong NSLS chapters. 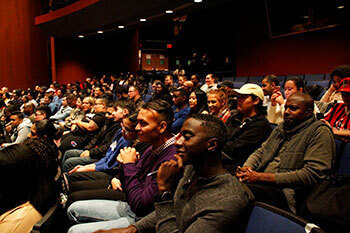 The College is the first CUNY campus to host a live broadcast. At the heart of NSLS is the development of leadership skills so that students can reach their dreams in college and beyond. To that aim, students must complete three components to be inducted into the Society. In addition to viewing at least three speaker broadcasts, students also must attend a Leadership Training Day as well as join a Success Networking Team (SNT). Within their SNT, which is comprised of a small group of peers, students set action plans using the SMART model—a model used to set and achieve attainable goals. Ultimately, the goal of NSLS is aligned with the goal of all of John Jay’s programs housed out of CSIL’s office: to develop professional leaders who will become fierce advocates for justice.